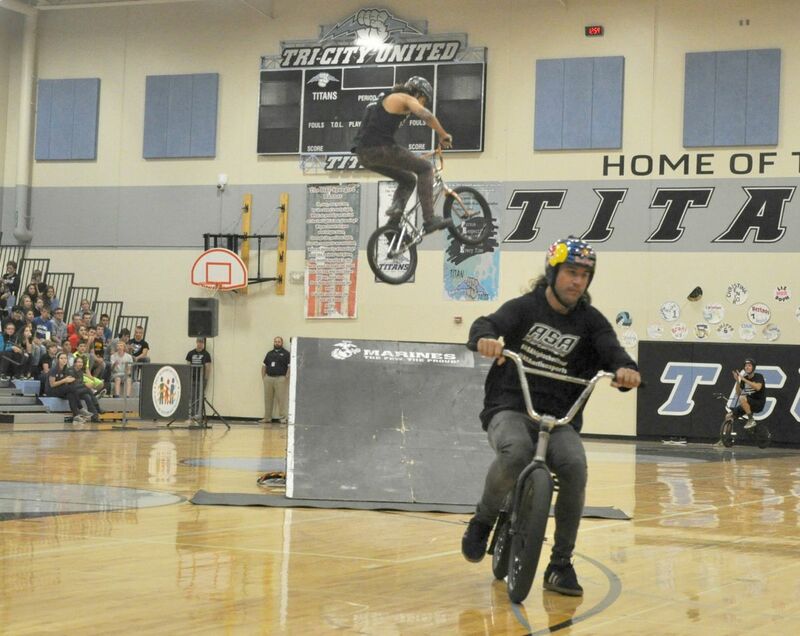 Some of the best extreme sports athletes in the world visited Tri-City United High School to share their big air with an even bigger message. 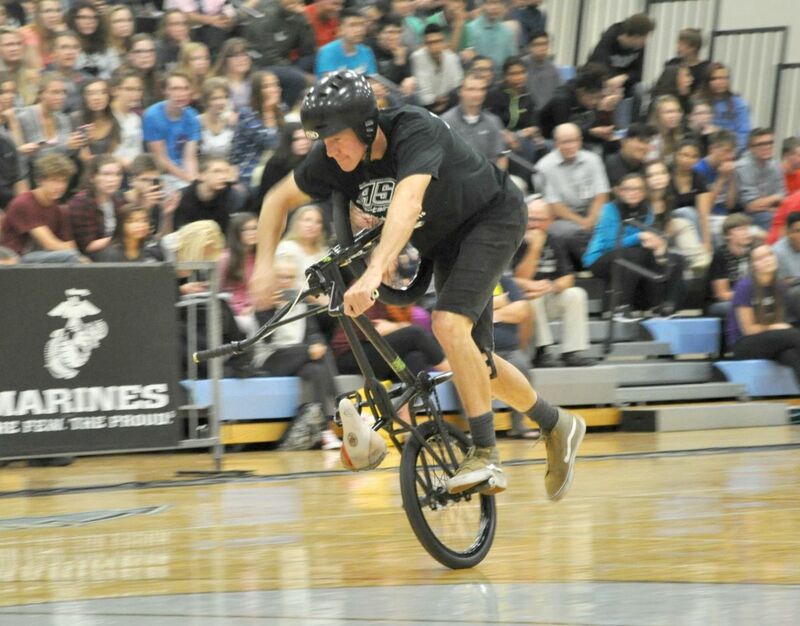 ASA Entertainment, an action sports company, is in the middle of a nationwide high school tour, sharing its anti-bullying message “No Place for Hate.” The group’s latest stop was at TCU’s gymnasium Sept. 12. Grice and fellow bikers Trevor Meyer, Alex Landeros, Mykel Larrin and Coco Zurita were all on hand to entertain the students. Meyer, a Chaska native, has won three gold medals at the X Games, the most prestigious action sports competition in the world. Throughout the 40-minute show, the riders continually showed off their best tricks, both on the ground and on a giant ramp. When Grice wasn’t explaining the bikers’ tricks he was sharing bullying statistics. Grice told the crowd that one of every 10 high school drop outs are because of bullying, and that 160,000 students miss school every day because of bullying. He also explained the three different types of bullying, physical, verbal and cyber, and how kids can best handle each situation. Grice also emphasized that bullying can happen to anyone, and that anyone can be a bully. The message struck home with many students. 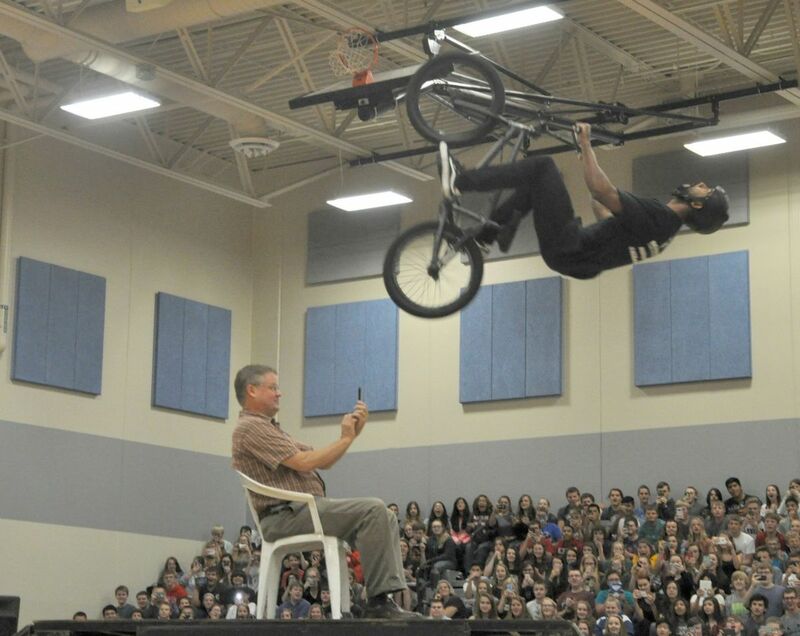 For the final trick of the assembly, TCU Principal Alan Fitterer volunteered to sit in a chair on top of the ramp as Larrin jumped over him on his bike. Almost everyone in the crowd had their cell phones out, and a joyous cheer shook the gym after the successful jump. Near the end of the show, Grice quizzed the kids to see if they were paying attention. The kids who answered questions correctly were rewarded with small prizes. “It’s crazy how much the kids remember. I had a teacher a few years ago say we’re tricking the students into learning, which is kind of true,” Grice said. Afterward, the bikers hung around to sign autographs while other students tried their luck on the Marines pull-up challenge. The excitement in the air was palpable, as kids replayed the show on their cell phones. However, the event’s message wasn’t lost at all. In fact, many students said they’d like to see the show again at TCU. • Nearly one out of every four students (22 percent) report being bullied during the school year. • More than half of bullying situations (57 percent) stop when a peer intervenes on behalf of the student being bullied. • The reasons for being bullied reported most often by students were appearance (55 percent), body shape (37 percent) and race (16 percent). Reach reporter Alex Kerkman at akerkman@lecenter.com or on Twitter @LCLalex2.